Eurobike 2017: What drew crowds at the show? De Rosa offers its first mountain bike called Big. An upspec'ed version of this 29er is called Bigger. FRIEDRICHSHAFEN, Germany (BRAIN) — Even over the noise of a big and busy show, it was hard to ignore the telltale sound of a car alarm. Coming from an e-bike locked to a lamppost in Abus' booth, the alarm was loud enough to make you look over to see what was going on. FRIEDRICHSHAFEN, Germany (BRAIN) — The dust from a recent remodel had barely settled at Yeti Cycles' headquarters in Golden, Colorado, when it came time to hop a flight to Germany for Eurobike. SEATTLE (BRAIN) — When REI announced that it would send 16 female employees to Barnett's Bicycle Institute for a women's-only course, the outdoor retailer received more than 350 applications. The two-week course was held at BBI's campus in Colorado Springs, Colorado, earlier this month. TUCSON, Ariz. (BRAIN) — Following what retailer Seton Claggett described as a brutal five-year legal battle with his bank, TriSports.com is closing. STATESVILLE, N.C. (BRAIN) — In the months following retailer Jeff Archer's death after being struck by a car while crossing the street last July, the fate of his shop, First Flight Bicycles, remained uncertain. 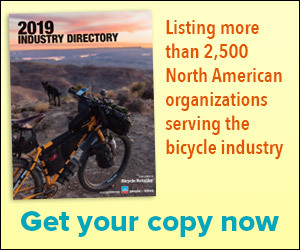 FARMINGTON, Utah (BRAIN) — Vista Outdoor, which owns several bike-related companies including Bell and Giro, has laid off 57 employees across its portfolio of more than 50 outdoor brands.